Lettuce “filler” transplants to fill gaps. 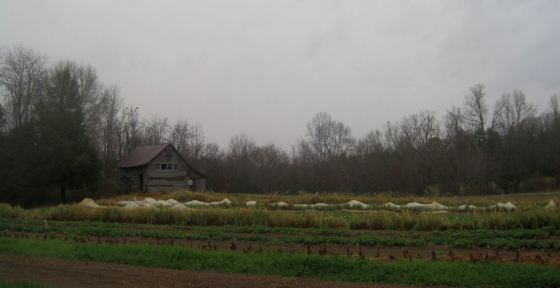 Because crops grow slowly in cold weather, if something goes wrong at the beginning of the winter, or in the fall, the consequences can cast a long shadow. It is not easy to make up for lost time. In spring, the weather is getting warmer, the daylight is lengthening, and you may have noticed that later sowings can catch up with ones a week or two earlier, allowing for a second chance. In the fall, the rate of growth is moving in the opposite direction, and later sowings will stand no chance of catching up. Even worse, they may get “trapped” like Persephone in the Underworld during the dark Persephone Days. But don’t despair – there are things you can do ahead of time to be prepared for plans going awry, and there are even a few things you can do instead of your original plan, to ensure you get some crops to harvest. Transplant seedlings under insect netting outdoors. We sow a lot of our winter crops outdoors in September, and transplant them into the hoophouse in October. This gives us an extra few weeks to prepare the hoophouse beds, and gives the seeds the cooler outdoor conditions to germinate in. We have three sowing dates. On September 30, we resow anything that didn’t do well in the 9/24 sowing, or substitutes. Emergency back-up seedlings for the hoophouse. This year, we had poor germination of a lot of the 9/15 sowings and too many of the 9/24 sowings. As a back-up for the back-up plans we sowed some crops in Winstrip trays, and spotted lettuce in open flats, which we kept inside the hoophouse. By that point, conditions in the hoophouse were more crop-friendly than outdoors. We did need some of these, and the rest we harvested for salad mixes right out of the flats! We were short of salad items because of the late establishment of the plants, so every plant was a help! A flat of lettuce transplants in the path in the hoophouse. Our goal is to keep the space filled with useful crops. The fall transplant program I describe above. Filler crops: As well as scheduled plantings, in October we sow a few short rows of spinach, lettuce, Senposai, Yukina Savoy, Maruba Santoh, Tokyo Bekana to transplant into gaps as soon as they occur. We simply dig them up, replant where needed and water well. Bare-root transplants are much easier than many fear. They save time and money, compared to growing starts in flats, and save on greenhouse space. They are very sturdy plants, as they have the full depth of soil to develop big roots. Little extra care is needed, as they are less prone to drying out than seedlings in flats. Alternatively you could keep some plug flats of these plants handy. We fill gaps with Asian greens, spinach or lettuces as appropriate, until Jan 25. From Jan 25 to Feb 20 we fill all gaps everywhere with spinach From Feb 20, we only fill gaps on the outer thirds of the beds, leaving centers free for tomatoes, etc. Filler brassica transplants in our hoophouse in November. Fast Catch Crops. Some cool-weather crops mature in 60 days or less. Mostly these are greens and fast-growing root crops. Useful if a crop fails, or you have a small empty space. Details on some of these follow the list. Ready in 30–35 days in fall, longer in winter: arugula, many Asian greens (Chinese Napa cabbage, Komatsuna, Maruba Santoh, mizuna, pak choy,.Senposai, tatsoi, Tokyo Bekana and Yukina Savoy), brassica salad mixes, chard, kale, radishes, salad greens (lettuce, endives, chicories) spinach and winter purslane. Peashoots in late winter or spring. Ready in 35–45 days in fall: chervil, corn salad, land cress, parsley and sorrel. Ready in 60 days in fall: beets, small fast cabbage, collards, kohlrabi and turnips. Asian greens are better able to germinate in hot weather than lettuce, and are faster growing than lettuce. Transplant 2-3 weeks after fall sowing, or direct sow. Asian greens are nutritious as well as tasty – flavors vary from mild to peppery – read the catalog descriptions before growing lots. Colors cover the spectrum: chartreuse, bright green, dark green and purple. A diversity of crops without a diversity of growing methods! Interesting mustard mixes are sold for salad mixes. We often mix our own Brassica Salad Mix from leftover random brassica seeds. 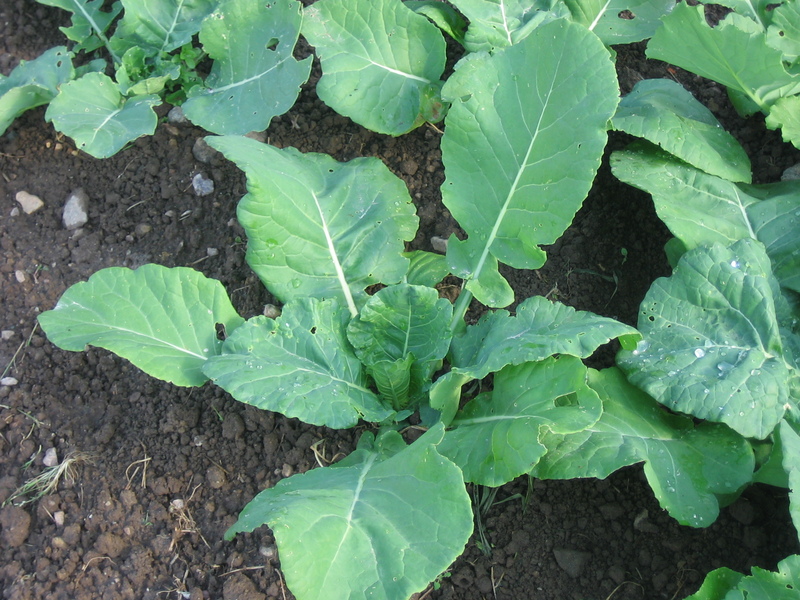 For a single cut, almost all brassicas are suitable – just avoid turnips and radishes with prickly leaves! We sow between 10/2 and 11/14 for winter harvest and from 12/4 to 2/12 for March and early April harvests. We’re zone 7, central Virginia. Green chard is hardier than the multi-colored Bright Lights. Days to maturity: 61 – 103 days, a big difference, depending when you sow. Sow 9/15, harvest 11/15 – 5/10; Sow 10/26, harvest 2/6 – 5/10. Radishes in our hoophouse in February. Varieties we like: Easter Egg, White Icicle, and Cherry Belle. Sparkler got too fibrous for us, as did Cherry Belle after mid Oct. We make 6 sowings 9/6 – 1/26. Small radishes take 27–52 days to maturity, not counting days too cold to grow. Scallions in our hoophouse in late November. We loved Tyee and now grow Escalade, Reflect, Acadia and smooth leaf Renegade. Renegade makes good Nov/Dec growth; Acadia, Escalade yield well Jan – April; January sown Reflect does well. We do 2 sowings of chard, scallions, tatsoi and yukina savoy; 3 sowings of mizuna, turnips and bulb onions; 4 sowings of baby lettuce mix and brassica salad mix; 5 sowings of spinach and radish. Our goal is to provide a continuous supply. Gather sowing and harvest start and finish dates for each planting of each crop you are growing as successions. Make a graph for each crop: sowing date along the horizontal (x) axis; harvest start date along the vertical (y) axis. Mark in all your data. Join with a line. Smooth the line. From your first possible sowing date find the first harvest start date. Decide the last worthwhile harvest start date, mark that. Divide the harvest period into a whole number of equal segments, according to how often you want a new patch. Overgrown hoophouse filler greens in our hoophouse in December. In Indiana (in Zone 5b) Ben Hartman (The Lean Farm) sows salad greens & spinach for winter harvests every week Sept 15–Oct 15. Baby lettuce sown before Oct 22 takes 5–6 weeks until harvest. If sown Oct 24–Nov 16, it takes 8–17 weeks to harvest. In Zone 5b, if you want baby lettuce mix before December, sow before Oct 22. Spinach sown before Oct 11 takes 4–6 weeks to harvest. 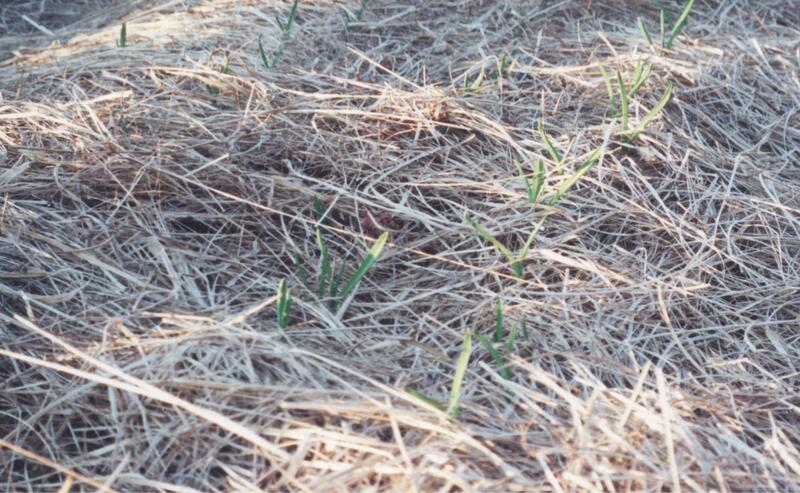 If sown from Oct 20–Nov 1, it takes 12–15 weeks. To harvest spinach before December, he sows before the middle of October. For new year harvests he sows every week Oct 15–Nov 1. He then takes a two month break from planting (Nov-Dec). Jan 1–Jan 15 he sows both salad greens and spinach for late winter. In Zone 7 we can harvest outdoor lettuce and spinach in December, and we have less urgency about early hoophouse sowings (and we get no winter break!). Our hoophouse is covered mid-May to early-September with a large shadecloth. Today we’re removing the giant piece of shadecloth that has been over the top of our hoophouse since mid-May. We’ll unclip the ropes, roll them up, then pull the shadecloth off onto the ground, roll and bundle it up. It’s important to store it so mice can’t get into the bundle and make holes. We already have a few of those! The shadecloth is held on by ropes zig-zagging between snap grommets on the shadecloth and large hooks on the baseboard. We’ve just finished preparing the first of our 7 hoophouse beds for the winter greens. Crops grow so fast in the hoophouse, and the organic matter in the soil is consumed at a rapid rate. Every new crop requires a fertility boost. In the fall, we prepare our beds by removing all the summer crops, and spreading four or five wheel­barrows of compost per 4′ × 96′ (1.2 × 29 m) bed. This is a generous 46 gals/100 ft2 (or 680 L/36 m2 bed)or more. A full wheelbarrow generally holds six cubic feet (44 gallons or 170 liters). 1 ft3 = 7.5 US gals. An inch of compost is about 8 ft3/100 ft2, or 60 gals/100 ft2; 20 gals/100 ft2 is 15 tons/acre (8.6 L/m2). Other professional growers use any­where from 12–40 gals/100 ft2 (5–17 L/m2). Some use much more. 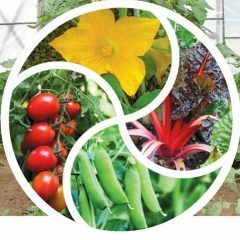 There are 3 concerns about using too much compost: high phosphorus levels, raised salt levels and nitrate accumulation. Some growers like to do two years of high compost rates (40 gals/100 ft2, 17 L/m2 or more), then reduce the rate to half that and add fish or kelp, at only 5 oz–8 oz/100 ft2 (15–24 gm/m2) per year. Sustainable alternatives to compost in­clude organic pelleted chicken manure, alfalfa meal, etc. A few years after we put up our hoophouse, we noticed that despite our best efforts, we were walking on the edges of the beds and compact­ing them. Initially we simply loosened the edges of the beds with a digging fork. We then noticed that the plants on the edges grew better, and we realized the whole bed width needed loosening. If you have designed your hoophouse to use trac­tor equipment there, that will deal with soil com­paction. We wanted our hoophouse to be free of internal combustion engines and fossil fuels, and the broadfork has provided the solution. Ours is an all-steel broadfork from Way Cool Tools. We do an annual broadforking each fall, before planting our winter greens. We set nylon twine to mark the bed edges, holding it in place using sod staples. The string alone has not been enough to stop us walking on the bed edges. 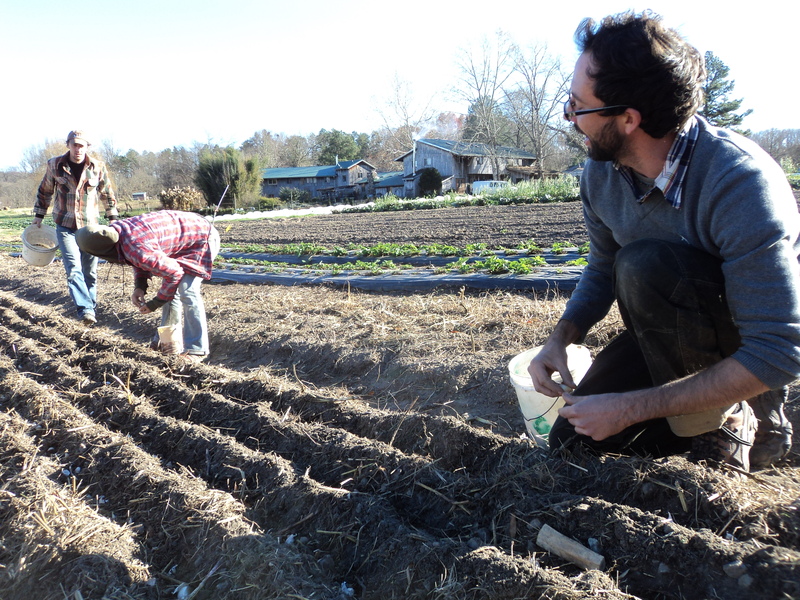 Loose soil is important because our winter crops grow all the way to the edges of the beds. After spreading compost, we broadfork the beds, then vigorously work the compost into the top of the soil with scuffle hoes and rakes. We learned the hard way the importance of raking the soil to a fine tilth immediately after broadforking — you don’t want to let the broadforked clumps dry out into bricks before you rake! See the photo below and imagine what could happen! Hoophouse bed broadforked to aerate the soil without inverting. I wrote about our bed prep method and tools, and also our outdoor sowings for transplanting into the hoophouse, with a special focus on suitable lettuce varieties in my post Sowing hoophouse winter crops here in Sept 2017. We have just started planting our late fall, winter and early spring crops in the hoophouse. We are pre-sprouting our spinach for a week in a jar in the fridge. Soak the seed overnight, drain it in the morning, fit a mesh lid on the jar, and lay it on its side in the fridge. Once a day, give the jar a quarter turn to tumble the seeds and even out the moisture. If the seeds are a bit wet when you need to sow them, and clumped together, pour them out on a cloth to dry a bit before sowing. We will sow five crops in our first bed on September 6 and 7– spinach, tatsoi, Bulls Blood beet greens, radishes and scallions. On September 15 we sow lettuces, chard, pak choy, Chinese cabbage, Tokyo Bekana and Yukina Savoy, in an outdoor bed to be transplanted into the hoophouse in a few weeks, after we’ve prepared another bed. We plant crops closer in the hoophouse than outdoors, and closer to the edges of the beds. We don’t have many weeds in the hoophouse, and the paths are marked off with twine, to keep us from stepping on the beds. We find that the soil does slump and compact some of its own accord, even if we don’t step on the edges (and of course, some feet do find themselves on the bed edges), hence the once-a-year broadforking. Young spinach plants (and henbit!) in our hoophouse in December. This is our second sowing, not the early September one. Spread a generous layer of compost over the whole bed surface. Broadfork the whole bed, but not all at once. Only broadfork the amount of space you have time to rake immediately, otherwise the warm hoophouse conditions dry out the soil and make it harder to cultivate into a fine tilth, which is the next task. We tackle 1/3 bed each day. To use a broadfork, go backwards working the width of the bed. Stab the tines into the soil and step on the crossbar, holding the long handles. Step from foot to foot until the crossbar touches the soil, with the tines all the way in, then step off backwards, pulling the handles towards you. This loosens a big area of soil, which hopefully crumbles into chunks. Lift the broadfork and set it back in the soil about 6” (15 cm) back from the first bite. Note: you are not inverting the soil – this is not a “digging over” process. Step on the bar and repeat. Sometimes we use a rake, breaking the clumps up with the back of the rake, then raking the soil to break up the smaller lumps, and reshape the bed. More often we use a wide stirrup hoe very energetically. This isn’t the job stirrup hoes were designed for (that’s very shallow hoeing), but the sharp hoe blade does a really good job of breaking up clumpy soil. We’ve found it important to lay the drip tapes back in place in between each day’s work, so that the soil gets irrigated when we run the system and stays damp. We don’t want dead, baked soil. When the bed is prepared, we measure out the areas for different crops and mark them with flags. Next we use our row-marker rake (bed prep rake) from Johnny’s Selected Seeds. After the rowmarking, we deepen the furrows if needed (often it’s not needed), using a pointed hoe, then sow the seeds. Cold-tolerant lettuce and the rest, our January 2018 assessment of the varieties we grew that winter and which survived the unusually cold spell we had. Here’s the long version of one of the slideshows I presented on January 13 at the Future Harvest CASA conference. Since I got home, I updated my Winter-Kill Temperatures list, which appears in the slideshow. Compared to my list for 2016, there are a few differences, nothing major. We had some extremely cold weather, as I reported last week with some sorry pictures of lettuces. Now I have some photos of the outdoor crops too. The Vates kale had mixed survival, the rowcovered Reflect and Avon spinach are damaged but OK, the Tadorna leeks are battered but hanging in there (so are we!). Vates kale which survived temperatures of -8F and -9F outdoors, uncovered. Vates kale with a freeze-killed center January 19 2018. For several years I have been keeping records of how well our crops do in the colder season. I note each increasingly cold minimum temperature and when the various crops die of cold, to fine tune our planting for next year. We had some extremely cold temperatures of -8°F and -9°F (-22°C and -23°C) in early January 2018. We are in zone 7a, with an average annual minimum temperature of 0-5°F (-18°C to -15°C). Unless otherwise stated, these are killing temperatures of crops outdoors without any rowcover. All greens do a lot better with protection against cold drying winds. Note that repeated cold temperatures can kill crops that can survive a single dip to a low temperature, and that cold winds, or cold wet weather can destroy plants quicker than simple cold. Your own experience with your soils, micro-climates and rain levels may lead you to use different temperatures in your crop planning. Our double-skin hoophouse keeps night time temperatures about 8F (4.5C) degrees warmer than outdoors, sometimes 10F (5.5C) warmer. Plus, plants tolerate lower temperatures inside a hoophouse. The soil stays warmer and the plants recover in the warmer daytime conditions (it seems to be the night+day average temperature that counts). In the hoophouse (8F warmer than outside) plants without extra rowcover can survive 14F colder than they could survive outside; 21F colder than outside with rowcover (1.25oz Typar/Xavan). 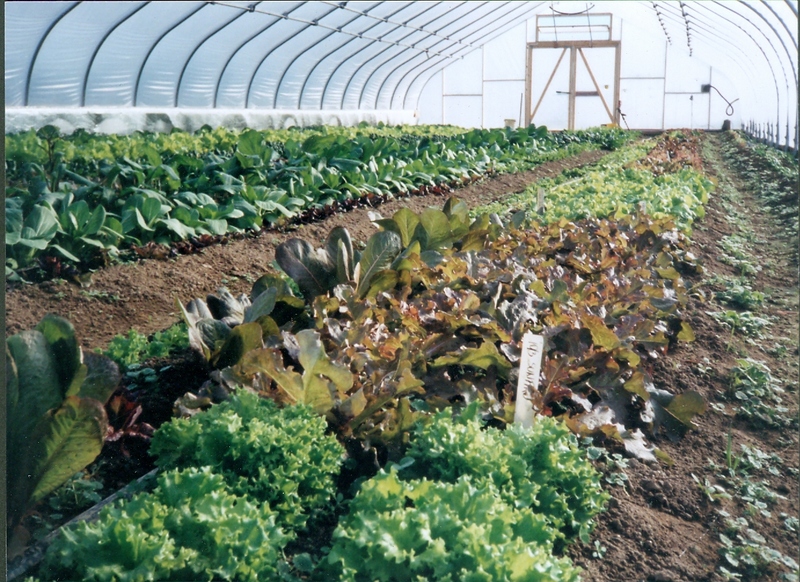 For example, salad greens in a hoophouse can survive nights with outdoor lows of 14°F (-10°C) without inner rowcover. Lettuce, mizuna, turnips, Russian kales, Senposai, Tyee spinach, tatsoi, Yukina Savoy survived a hoophouse temperature of 10.4°F (-12°C) without rowcover, -2.2°F (-19°C) with. Bright Lights chard got frozen leaf stems. Lettuce hardy enough for a solar heated winter hoophouse in zone 7a (hardiest are in bold): Buckley, Ezrilla, Green Forest, Green Star, Hampton, Hyper Red Rumpled Wave, Marvel of Four Seasons, Merlot, New Red Fire, North Pole bibb, Outredgeous, Pirat, Red Cross bibb, Red Sails, Red Salad Bowl, Red Tinged Winter, Revolution, Rouge d’Hiver, Salad Bowl, Sylvesta bibb, Tango, Winter Marvel, Winter Wonderland. 32°F (0°C): Bush beans, cauliflower curds, corn, cowpeas, cucumbers, eggplant, limas, melons, okra, some Pak Choy, peanuts, peppers, potato vines, squash vines, sweet potato vines, tomatoes. 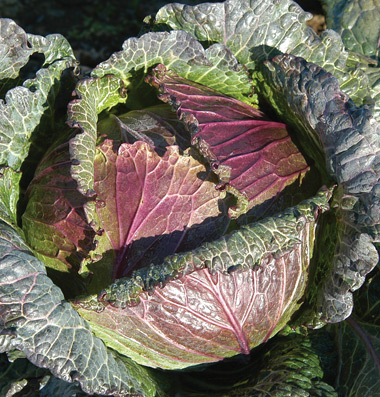 27°F (-3°C): Many cabbage varieties, Sugarloaf chicory (takes only light frosts). 25°F (-4°C): Some cabbage, chervil, chicory roots for chicons, and hearts, Chinese Napa cabbage (Blues), dill (Fernleaf), endive (Escarole more frost-hardy than Frisée), some fava beans (Windsor), annual fennel, some mustards (Red Giant, Southern Curled) and Asian greens (Maruba Santoh, Mizuna, most Pak Choy, Tokyo Bekana), onion scallions (some are much more hardy), radicchio. Spinach under rowcover, with our hoophouse in the background – crop protection pays! 22°F (-6°C): Some arugula (some varieties are hardier), Bright Lights chard, large leaves of lettuce (protected hearts and small plants will survive colder temperatures), rhubarb stems and leaves. 20°F (-7°C): Some beets (Bulls Blood, Chioggia,), broccoli heads (maybe OK to 15F), Brussels sprouts, some cabbages (the insides may still be good even if the outer leaves are damaged), celeriac, celtuce (stem lettuce), some head lettuce, some mustards/Asian greens (Tendergreen, Tyfon Holland greens), flat leaf parsley, radishes (Cherry Belle), most turnips (Noir d’Hiver is the most cold-tolerant variety). Canadian (spring) field peas are hardy to 10-20°F (-12 to -7°C). 15°F (-9.5°C): Some beets (Albina Verduna, Lutz Winterkeeper), beet leaves, some broccoli, some cabbage (Kaitlin, Tribute), covered celery (Ventura), red chard, cilantro, endive, fava beans (Aquadulce Claudia), Red Russian and White Russian kales, kohlrabi, some lettuce, especially medium-sized plants with 4-10 leaves (Marvel of Four Seasons, Olga, Rouge d’hiver, Tango, Winter Density), curly leaf parsley, rutabagas (American Purple Top Yellow, Laurentian) if not covered, broad leaf sorrel, most covered turnips, winter cress. 12°F (-11°C): Some beets (Cylindra,), some broccoli, Brussels sprouts, some cabbage (January King, Savoy types), carrots (Danvers, Oxheart), most collards, some fava beans (mostly cover crop varieties), garlic tops if fairly large, most fall or summer varieties of leeks (Lincoln, King Richard), large tops of potato onions, covered rutabagas, Senposai leaves (the core of the plant may survive 10°F/-12°C), some turnips (Purple Top). 10°F (-12°C): Covered beets, Purple Sprouting broccoli for spring harvest, a few cabbages (Deadon), chard (green chard is hardier than multi-colored types), some collards (Morris Heading can survive at least one night at 10F), Belle Isle upland cress, some endive (Perfect, President), young Bronze fennel, probably Komatsuna, some leeks (American Flag, Jaune du Poiteau), some covered lettuce (Pirat, Red Salad Bowl, Salad Bowl, Sylvesta, Winter Marvel), covered winter radish (Daikon, China Rose, Shunkyo Semi-Long survive 10°F/-12°C), large leaves of savoyed spinach (more hardy than flat leafed varieties), Tatsoi, Yukina Savoy. Oats cover crop of a medium size die around 10°F (-12°C). Large oat plants will die completely at 6°F (-17°C) or even milder than that. 5°F (-15°C): Garlic tops even if small, some kale (Winterbor, Westland Winter), some leeks (Bulgarian Giant, Laura), some bulb onions, potato onions and other multiplier onions, smaller leaves of savoyed spinach and broad leaf sorrel. Many of the Even’Star Ice Bred greens varieties are hardy down to 6°F (-14°C), a few unprotected lettuces if small (Winter Marvel, Tango, North Pole, Green Forest). Tadorna leeks, struggling but not dead, after -9F. -5°F (-19°C): Leaves of overwintering varieties of cauliflower die, Vates kale survives although some leaves may be too damaged to use. Reflect spinach in the open got damaged but not killed at -9F. -10°F (-23°C) Austrian Winter Field Peas and Crimson clover (used as cover crops). -40°F (-40°C) Winter wheat and winter rye (cover crops). A cover crop of winter wheat untroubled by -9F.